Welcome to the third Trans-Dales Trail. Like the other Dales Trails, this is also about sixty miles in length and can be comfortably completed by anyone that is reasonably fit in five days, with four nights Bed & Breakfast accommodation. As before, the route aims establish links from Dale to Dale using some of the public rights of way that are less frequently walked. In fact this time we were to discover places with no trace of a path existing on the ground. On the crossing of the moor from Coverdale to Nidderdale in particular, you will need to have your map and compass handy. I wouldn't wish anyone to deviate towards Dead Man's Hill! 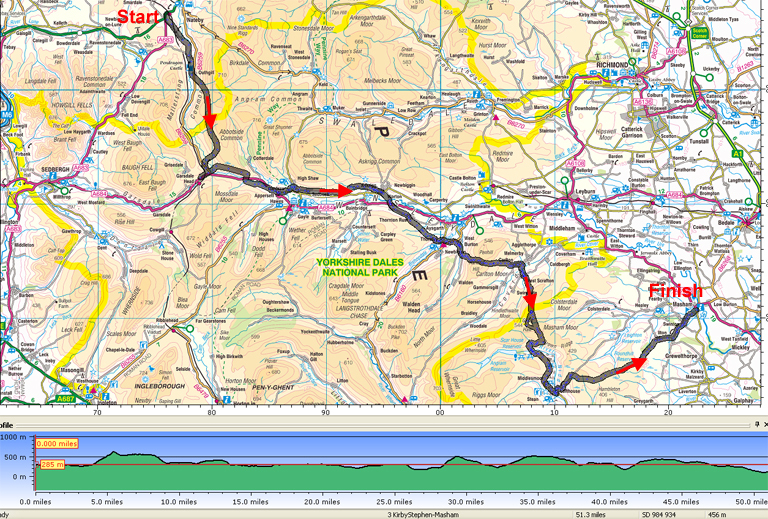 The problems we encountered with the route in Upper Nidderdale means that the guide offers you several options - and it is essential that you have the use the 1:25000 map. The route again deliberately visits parts of the Dales new to me, Mallerstangdale, Coverdale, and that "no-mans land" between Nidderdale and Masham. Some of the paths and tracks used are ancient packhorse or drove roads or wagon ways to long disused mine workings. One is even an old Corpse road! Although this walk does not reach the heights attained on previous Trails, there are some steep climbs and some rough tracks and pathless moorland, which together make Trail 3 seem more strenuous. Or was it because we were a year older and that the weather was rather unkind to us when we made this trek in June 1997? The thinking behind Trail 3 was that you could arrive at the start of the Trail by train over the scenic Settle-Carlisle line and at the finish you could celebrate with a visit to one or both of the breweries in Masham. You will most likely need to be collected from Masham as it's not well served by public transport. After an hour or so in the breweries you will probably need picking up anyway! This third route intersects Trail 1 at Middlesmoor and Trail 2 at Askrigg, thus opening up possibilities of walks incorporating parts of more than one Trans-Dales Trail. 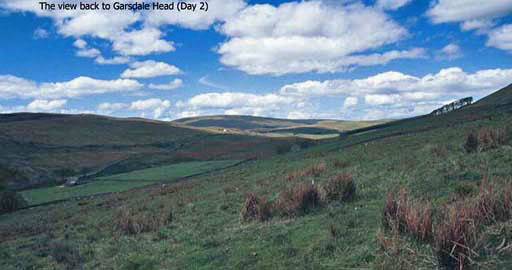 "Trans-Dales Trail 3" starts in Cumbria, about 6 miles outside the Yorkshire Dales National Park. After about 30 miles it leaves the National Park on West Scrafton Moor and enters Nidderdale, an area recognised as being of Outstanding Natural Beauty. . I hope the guide booklet, and others in the series, will inspire you to explore parts of the Yorkshire Dales that are 'off the beaten track'. Together with Peter Tomkinson, I walked this route in June 1997, and it is that which is described in detail in the guide. Finally can I say how good it is to hear from folk who have completed the Trails - so far those I know about have found their walks to be most enjoyable. Booklets for Trans-Dales Trail 3 are no longer available, but the route description can be downloaded for FREE as a pdf file.